Whether you’re searching for a fence for your courtyard or your primary yard, you might find just what you’re looking for in a CourtYard aluminum fence. These fencing systems combine beauty, strength, and durability to create a virtually maintenance-free barrier. If you need a lovely and long-lasting residential fence, industrial fence, or gate, you can find a CourtYard product to suit your needs. To learn a bit more about this range of aluminum fencing products, simply scroll down. If you’re concerned about the environment, you’ll be pleased to hear that CourtYard aluminum fence systems are “green.” They use a minimum of 40% post-industrial content in the aluminum billet prior to extrusion, and there is zero volatile organic compound (VOC) emission from the powder coating process. CourtYard aluminum fence systems are available in twelve standard colors through an 11-step architectural-grade power coating process (view pages 12-13 of our brochure to learn about each step). All colors are the same price, from basic black and white to speckled walnut and sandy shore, except for silver which costs an additional 15% and requires a minimum order. There are also custom color options available. There are ten CourtYard aluminum fence styles to choose from in the Hundred Series, and these styles are available in the following heights: 36″, 42″, 48″, 55″, 60″, and 72″. Whether you want a fence with a flat top, spear points, or both, you’ll have a few options from which to choose. There are also options with spears in a concave or convex curve. In the 1000 Series, there are six models available in heights of 36″, 42″, 48″, 55″, 60″, and 72″. All of these options are very durable and come with a lifetime warranty, so you won’t have to worry about future damage. In the 2000 Series, there are five models to choose from, and they come in heights of 48″, 54″, 60″, and 72″. A ring style is optional, and there is also a welded plate option for posts. If you don’t like certain design details that come with the standard fence styles, you can customize your fence with special features and accessories. For example, you might choose a zinc die-cast triad or quad finial in place of the standard spear. Or, you might like to have ball caps in place of standard flat caps. Will your fence require a gate? No problem! Simply determine the opening size, decide which fence style and height you will be matching, and consider whether or not you will need a custom-designed gate. You can choose a single, double drive, or cantilever gate. Additionally, the cantilever top track rail can be designed as a mid-rail with design components above the top rack, allowing for interesting details like a designer arch or a continuous arch. Gates are available in all of the twelve standard fence colors. If you’re interested in learning more about the CourtYard aluminum fence systems, check out the training video above or view our handy brochure. You’ll find all the specifications you need, from powder coating colors to optional features and specific post/rail measurements. When you’re ready to purchase your new fence, head to MMC Fencing & Railing. 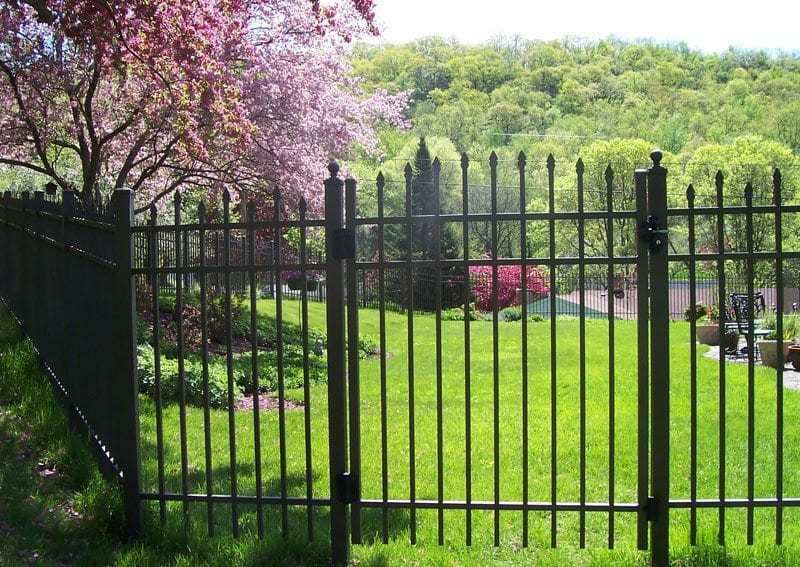 In our online store, you’ll find a variety of CourtYard aluminum fence systems. To learn more, please give us a call at 1-866-931-5002 or click here to request a quote. We look forward to hearing from you!